These pirates need YOU to finish their stories. Treasure, storms or sea monsters: what’s next? 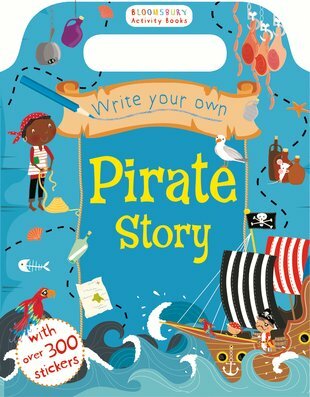 We all love a brilliant pirate story, right? Shiver-me-timbers, of course we do! But what do you think the perfect pirate story should have in it? Here’s your chance to decide. In this book, the first line of each story is there for you. But you decide what comes next (with some cool tips to help you). Plus: you get two stories to read, and over 300 stickers. Gold doubloons. Fierce sea battles. Desert islands. Put your words to work.